A week or two back, K and I had been to Duxton Hill for a Mexican refill (more about it later) and then walked down to Tanjong Pagar in search of a dessert that would call out to us. In no way did we think we would stumble upon a beautiful film photography cafe that now houses ice-creams and other desserts with coffee! I have to give this to K, amidst all the distraction on the street, he spotted this and said, “Let’s try this out”. I know we will be going back again. The shots are all taken in the night and pretty half-heartedly because really, all I wanted to do was drink coffee and stuff my face with waffles. Also, I have tried my best to cut off faces from the photos. Now that am done with my lame excuse for bad photography, let me tell you more about the place and what we had. A play on the phrase, “find the moments”, this cafe has beautiful photos on the walls and a very grey-meets white meets blue vintage feel that I totally dig. also, some of the tables were apparently sewing machines that were converted to serve a different function altogether. Fascinating, no? I absolutely loved the metal chairs that went so well with the decor. I admit some can be a bit(a wee bit) uncomfortable to sit but hey, sometimes prettiness comes at a price. Can you see all the vintage camera on display? I love how it feels a regular kopi-shop and yet takes it to an altogether different level. These little art pieces from different parts of the world added to the charm and somehow felt totally in place and not overdone. We were sitting right next to this pretty sight. I don’t know what caused it, but these days am a huge huge fan of white backgrounds with minimal art against it. I follow pretty much every instagram account that has such photography and so much that I photograph every little thing against my white kitchen platform. Too bad that I don’t like ice cream. This cafe had super unique flavours panetella, dark truffle, ebony (!) and what not. I will make a note of those names when I go next. They keep changing the flavours and source the key ingredients from across the world. K (as usual) had a classic vanilla scoop and loved it – not too sweet, creamy and just perfect, he said. Well, I had grand plans. I went with the buttermilk waffles with a drizzle of chocolate sauce. I like waffles with maple syrup or vanilla sauce but they had neither, so chocolate sauce it was. Crispy on the exterior, soft on the inside and a very faint flavour of butter – perfetto! I loved every bite of it. I don’t like my waffles too sweet and this waffle seemed to be made for my palate. K and I also tried a bit of this waffle with vanilla ice-cream and it was really good though I much prefer the version sans ice-cream. We noticed people queuing to get a seat and so like good kids, decided to come for coffee another time and let the others “find their moments”. I must confess. I am a cafe junkie. If there is one place where I can be studious, poetic, lost, happy, tranquil, in love, lonely – it has to be a cafe. I can spend days in a cafe. There have been instances where I have accompanied K on his business trip and spent entire days cafe- hopping while he works. This cafe by virtue of its location in CBD is not going to be a quiet place but rather vibrant, artsy and inspiring in its own way. And I am glad to have found this gem that tickles my love for art, tucked away in one of the busiest streets of Singapore. I am with you in loving minimal art against a white wall. Hello! 🙂 That would be great and it’d be wonderful to hear what you think! Always on a hunt for cafes with interesting menu and great ambience. Wow, such a beautiful Ice-Cream Bar. Very well Decorated. Artistic Interiors. 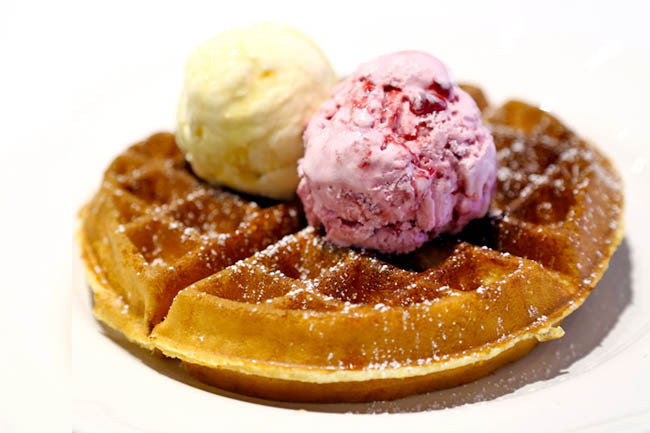 Waffles are the In Thing now in India. Try this combo. Its Delighting ! !